The idea of making an appointment with a nurse at the touch of a button on his phone is appealing to Guo Ruirong. The 75-year-old Chinese man, with no next of kin, no longer needs to travel to the hospital to receive nursing care, such as injections or blood sampling. This new kind of app came as a great relief to him, and he is not the only one to benefit. His nurse is also delighted. Like many of her colleagues, Wang Wenli, a 31-year-old nurse, works hard, but does not earn much. As soon as she heard that home nursing care apps were using an Uber-inspired model, she jumped at the opportunity. First launched a few years ago, these apps are no longer novelties in China. However, as they are still developed and managed by independent third parties, a lack of standards around this new kind of service is worrisome to both nurses like Wang and elderly patients like Guo. While the former is concerned about her personal safety, the latter worries about the quality and safety of the services provided. To address some of these concerns, Chinese health authorities launched a pilot program of home nursing care in February, which is described by Chinese Internet users as the "official version" of the nursing service apps. Six provincial-level regions across China, namely, Beijing, Tianjin, Shanghai, Jiangsu, Zhejiang and Guangdong, have been selected to conduct a test phase until the end of this year. As explained by Jiao Yahui, Deputy Director of the Bureau of Medical Administration of the National Health Commission, the test phase made addressing safety issues one of its priorities: both for health care personnel and nursing care patients. If Wang is tempted by the idea of working more to earn more, she hesitates when she thinks of her personal safety. When patients request services at night, she has to ask a friend to accompany her to visit the patients. Otherwise, she'd be afraid to go by herself. For safety reasons, the new pilot program stipulates that nurses must now be monitored by a GPS navigation system and identified with the help of a facial recognition system. In addition, the introduction of mobile warning equipment and the purchase of occupational accident insurance also help to reduce risks and prevent potential harm. On the patient side, the previous system was also far from perfect. "I am afraid that online nurses are not sufficiently qualified to provide safe and reliable medical services," said Guo. His concern is shared by many other patients. In the event of acute allergic crises to medicine or sudden illnesses, the basic equipment that nurses carry would be unable to provide them with the necessary care. To address concerns around nurses' qualifications, the official program specifies that nurses must have at least five years of nursing experience in actual brick-and-mortar clinics. In addition, the activities of nurses will now be monitored throughout their shift to facilitate traceability. Unlike private applications, the official app requires that such services must be provided by well-established health facilities. Home nursing care can now be considered as one of their additional services. Before sending their nurses to attend to patients outside, institutions will need to conduct a preliminary consultation with the applicants to assess their physical condition and identify what kind of nursing care they require. Following such assessment, if the facilities feel it is safe to provide services, they will then dispatch qualified and competent caregivers to their home. 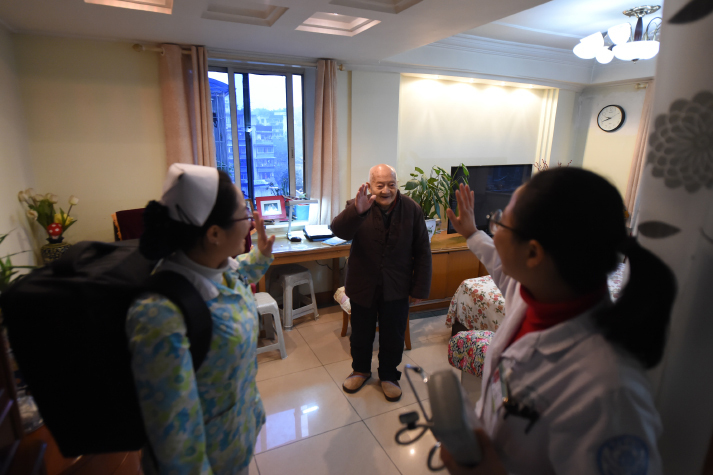 By launching the pilot program, health authorities are demonstrating their support for home nursing services, according to Wu Yuxiong, Executive Vice President of the Guangdong Family Doctor Association. "This is a good sign, because it will contribute to the development of the entire sector," he said. Previously, physicians did not take part in home nursing services. As a result, such services lacked consistency and their quality could not be guaranteed. With the new pilot program, home care nurses now comply with prescriptions issued by physicians. All this will reassure patients about the professional-level services provided, added Wu. 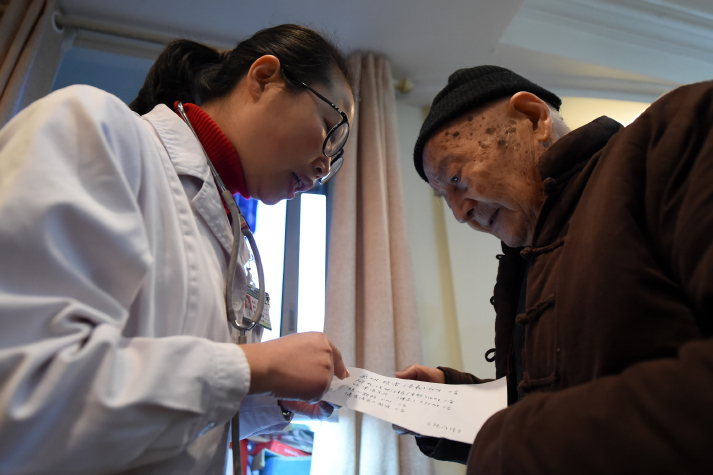 In addition to focusing on safety issues, the new pilot program is primarily aimed at elderly patients living at home, according to the National Health Commission of China. The objective, therefore, is to meet the growing demand for home care in an ageing society. According to figures published by the National Bureau of Statistics (NBS) of China, at the end of 2018, China had 249.49 million citizens over the age of 60, or 17.9 percent of the population. Many of them suffered from chronic diseases. And of these, more than 40 million had a disability rating of at least 50 percent. In other words, they are unable to travel to their hospital to receive care. In addition, more than 90 percent of seniors in China prefer to stay at home rather than live in a retirement home. This makes it more necessary than ever to provide nursing services at home. In contrast, NBS statistics show that in 2018, there were around 4.12 million registered nurses in China, and the ratio was about 2.7 nurses per 1,000 patients, far behind the current ratio in developed countries of Europe and North America. Much effort has been put into developing and strengthening nursing education programs, but China still faces a nursing shortage. Wu believes that the growing offer of home nursing services will help to solve the mismatch between supply and demand. Currently, a significant number of patients need to recover at home and many seniors who are incapable of taking care of themselves require home care. Attending to these patients in a hospital would require a huge quantity of medical resources, without bringing more comfort to the patients. "With the development of the Internet, and in particular the development of Big Data, home care services are now more accessible than ever to elderly patients. This is an inspiring initiative that will maximize the use of medical resources," said Wu.